I believe you are right about a lot of your insights to what the future holds for all of us. I too have spent years researching out bible prophecy and have come to some of the same conclusions. I could write a book on a lot of things I disagree with you but will leave it at only one problem with your view. Let’s talk about the tribulation period that many including yourself believe is from the book of Daniel 9:24-27. Nowhere in scripture is there a prophecy split in time. It is not biblical or logical. My belief is that the 70th week followed the 69th week just as the 2nd week followed the first week. It is often overlooked that the 70 weeks have natural divisions of 7, 62 and 1 weeks. This is ready-made for a gap if there need be. In other words, the 2nd week must immediately follow the first week, but it is no necessarily so that the 70th week immediately follows the 69th. There are gaps in the original periods of broken Sabbath years from which the 70 years of punishment and 70 years of restoration are derived. Thomas Ice has a good series on the 70 weeks that covers the gaps of years in part 4 about this. If there are gaps in the original source of the 70 weeks, then there can be a gap in the fulfillment of prophecy based on it. A gap is implied by how it says the Messiah will be cut off “after 62 weeks” (Dan 9:26). Many never slow down to ask why it does not say he is cut off “in the last week” or “in the 63rd week?” That would be more natural and confirm the theory that the final week immediately follows the 62nd/69th week. Instead this “after the 62nd week” phrase implies that the last week does not follow directly but instead a period that is not the 1 week or 63rd week does. In other words, a non-week gap period before the final week. Given the above I see there is a precedent for a gap and the language of the Seventy Weeks prophecy also implies a gap after the 62nd/69th week. We have been in this gap period or delay between the 69th week and the 70th week ever since Jesus came and declared a Sabbath year and himself Messiah in Nazareth by claiming Isaiah 60:1 had been fulfilled by him. Thus, we’re awaiting the final “one”/70th week of the Seventy Weeks when most of what we read in Revelation is fulfilled including the literal 3½ year/42 month/1260 day Great Tribulation in the second half of that seven year period. After Wormwood comes. Is the 70th Week Half Over? The idea that Jesus had a 3½ year ministry instead of the 62 week ministry implied by Daniel’s “after 62 weeks he shall be cut off.” The 62 weeks are a dual prophecy. Added to the 7 years before them, the 69 weeks come to the year Jesus announced himself as Messiah late in the Sabbath year of 28/29 AD. Then 62 weeks, on Passover of the year 30, he was cut off. As I said above, it would be improper to call that period when he died the 63rd/70th/final week as Scripture itself calls it a period “after 62 weeks” only. I think for a good reason, as explained above. The idea that the covenant of the final/70th week is the New Covenant made by Jesus through his death. However, the context points to the “coming prince” of the people who destroyed the temple (the Romans) as being the “he” who makes a seven year covenant cutting off the sacrifices in the middle (without breaking it or a “peace treaty” contrary to what is believed). Daniel 11:31-32 talks more about the person who cuts off the sacrifices and creates the abomination. He flatters and corrupts people. This is not Jesus, obviously. The end time Beast/Antichrist/King of the North (Dan 11:40-45) is the one who does this in the 70th week. The 70th week is completely unfulfilled and yet future. The seven year pact made by the coming prince spans its entire period of exactly seven years. It is not already in effect and spanning 2000 years. When it happens there will be sacrifices again to be cut off and a temple for the prince to take over, defile with his abomination/image of the beast and make his headquarters (Dan 11:45) as he proves to the world he is God (2Th 2:4). I try to get here as much as possible to get a opinion on what I know about the bible, your research is very close to what i understand, but, like all things my understanding is mixed up with the teachings of my past, Methodist, Baptist, even Jehovahs Witnesses. 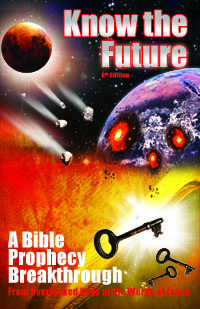 The subject of the end times seems as convoluted as there are versions of the bible, so i stick to KJV but have read different editions of the bible, I also, as you know, follow very closely the current events unfolding in both the EU, Israel, Russia, China and United States Of America, as these 5 countries will play the “Key” roles in prophecy. My reason for this, in the EU the people did not resist the EU roll out “Gun Confiscation, Banking Consolidation..etc” subsequently it has overtaken europe very quickly, with christians now being a minority and are being persecuted rather severely. Your thoughts would be appreciated, or point me to a place where you have already covered this on your website. Another thing you can mention when you talk to people who believe this, is the example from Isaiah 61. Jesus read it in the Nazareth synagogue, up until the end of the things He did in His first coming, and the rest are unfulfilled until His second coming, without explaining to the reader that there is a gap. Good point, Annette, I should have thought of that myself! As in Jn 2:9, 1:Pet 1:23 ,Reborn in us Jn 11:25 us together in Him !